Frantz is beautifully shot, with artful use of colour amidst the black and white. The acting from the leads, especially Paula Beer, is superb, and the whole production has an ethereal feel despite the deep emotion. I shed a number of tears throughout the film, particularly towards the end, which turned out to be not what I'd expected. This is not a happy piece, but it is a beautiful and stunning cinematic journey. 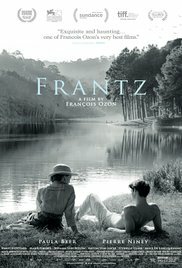 After seeing Frantz in the morning, I'd hoped for something more light-hearted and cheery in Their Finest. In a way, I got my wish, for there are plenty of comic lines and moments in this film. However, it wasn't quite as joyful as I'd expected and, once again, I didn't get the traditional happy ending I'd anticipated. 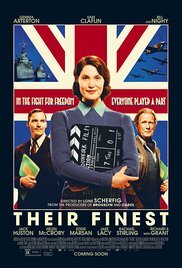 Despite that, this is a most enjoyable film, with excellent performances from the three leads, while Lone Scherfig does an excellent job blending humour and pathos.